They're back! Remember 2008 when armyworms marched from wheat into vegetable fields, eating everything in their path? Well, reports in western, NY are that populations of true armyworms in wheat are the highest they've been in years. True armyworms have also recently been reported in grass hay in Washington and Schenectady Cos., and in numerous crops, including sweet corn, Swiss Chard, and lettuce in Ulster/Orange Cos. According to the NYS IPM Weekly Field Crops Report, the most common infestation sites for true armyworm larvae include dense fields of grasses, including wheat and other cereals, grassy forages, fields with rye cover crops and corn. Good grass control within and along field margins helps reduce the risk of infestations. START SCOUTING NOW! When armyworms run out of food in wheat, cereal and grass fields, they will "march" into juicier crops, especially corn, and including vegetables. A 20- to 40-foot treated border around armyworm-infested wheat fields should prevent armyworms from entering other crops and minimizes the use of chemicals. Insecticide treatments for true armyworms are most effective if applied late in the day. Generally, true armyworms are easy to control with pyrethroid insecticides. It is important to detect problem areas early, while larvae are still small, because the large larvae do the most feeding and may quickly destroy whole stands. Armyworms feed at night, so check fields regularly for ragged holes chewed from the leaf margins, pellet-like frass on the ground and hidden larvae under plants and surface residue. "During the day, true armyworms curl up on the ground, typically beneath residue if they can find it. Larvae come in a range of colors (gray-green to tan). 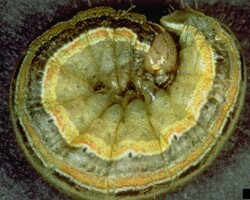 When residue is pulled back, larvae at first remain fairly still (typically curled up but occasionally sprawled out). However, in a short period of time the half inch to 1-3/4 inch long larvae begin to crawl rapidly looking for someplace else to hide such as additional residue or a soil crack. The true armyworm has a dark head capsule with a wide "V-shaped" marking between the eyes plus an orange stripe running down either side of the body. While some of these features may be shared by "look-a-like" larvae, true armyworm larvae can always be distinguished from other larvae by a series of dark bands/ diagonal black smudge-like markings on the prolegs (false legs) of older larvae. True armyworm larvae typically overwinter in the southern United States, and moths migrate back north each spring. Once here and once they have mated, females deposit eggs on the lower portion of host plant material. That host plant material can include corn, wheat, beans, cabbage, carrots, onions, peas, peppers, radishes, sweet potatoes, etc. Larvae feed for over a month and remove notches or large sections of leaf tissue on either side of the main veins. Left unchecked, all leaf tissue may be removed and plants may become soiled by frass (a polite term for insect feces). A few generations of true armyworm occur each season." Download the PDF below for websites to visit for additional information and photos.